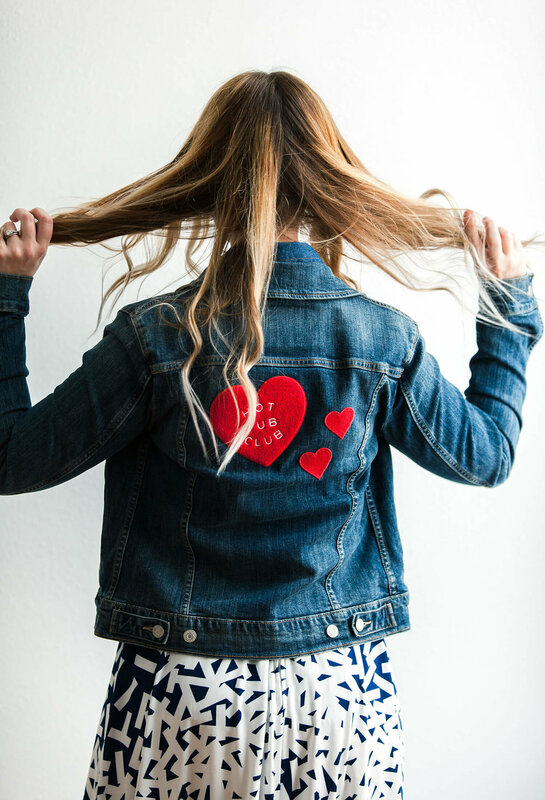 PERSONALIZE YOUR DENIM WITH EMBROIDERY! Friends, I could NOT be more excited to share this post today! 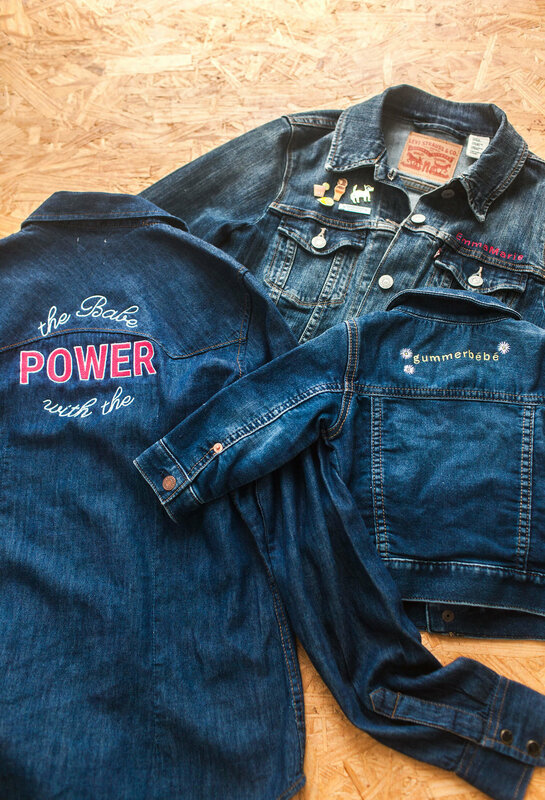 Weâ€™re talking about how to personalize denim (jackets, shirts, etc.) with embroideryâ€”so get excited! Weâ€™ve also got a little free pattern download for you as well, so stayed tuned for that! I actually completed three projects Iâ€™m sharing with you today. I added my name to my denim jacket. I deiced to embroider both my first and middle name (Emma Marie) as I rarely get to use my middle name, but I think itâ€™s pretty cute (thanks, Mom and Dad!). You could also embroider your initials, your IG handle name, or a nickname. The skyâ€™s the limit. 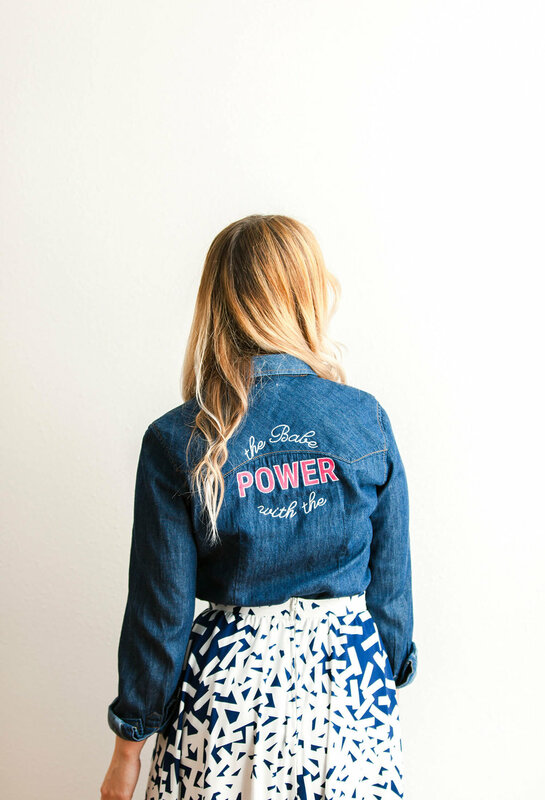 ðŸ™‚ I also embroidered this fun â€œThe Babe with the Powerâ€� design onto the back of a denim shirt. This is a quote from one of my favorite childhood movies (The Labyrinth) as well as a shirt we sell on Oui Fresh. And the third project is I embroidered a little present for the newest member of the A Beautiful Mess extended family. ðŸ™‚ Laura and Todd recently welcomed their baby girl into the world, so I made her a jacket that says â€œgummerbÃ©bÃ©â€�. I was sort of giving a nod to the fact that Laura is a major Francophile and also loved the book Bringing Up BÃ©bÃ©. I added a few hand-stitched daisies around the text as well. There are a number of different kinds of stabilizers. Above you can see the kind I used. 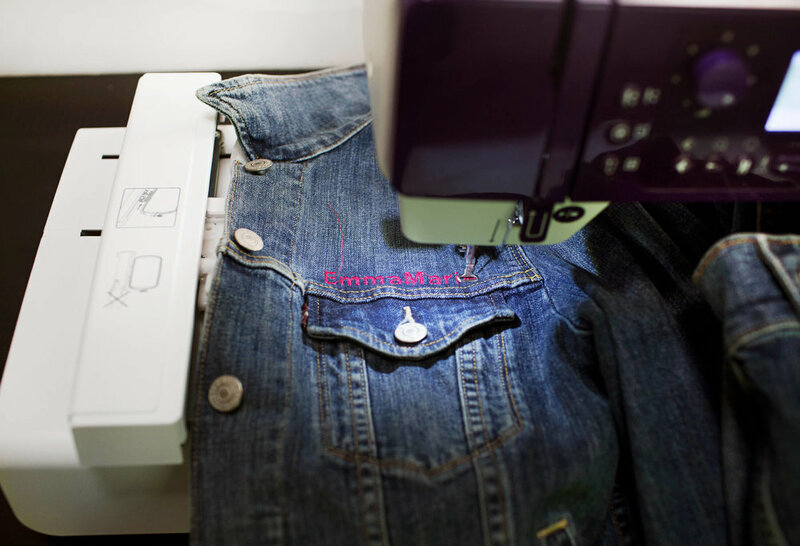 If you are embroidering on to denim or another sturdy fabric, then I like tear away stabilizers, and you can even consider using two layers as you work. If you are working on something more delicate, like a lace design or something of that nature, you might consider using a wash away stabilizer. Cut a piece or two of the stabilizer and hoop it. 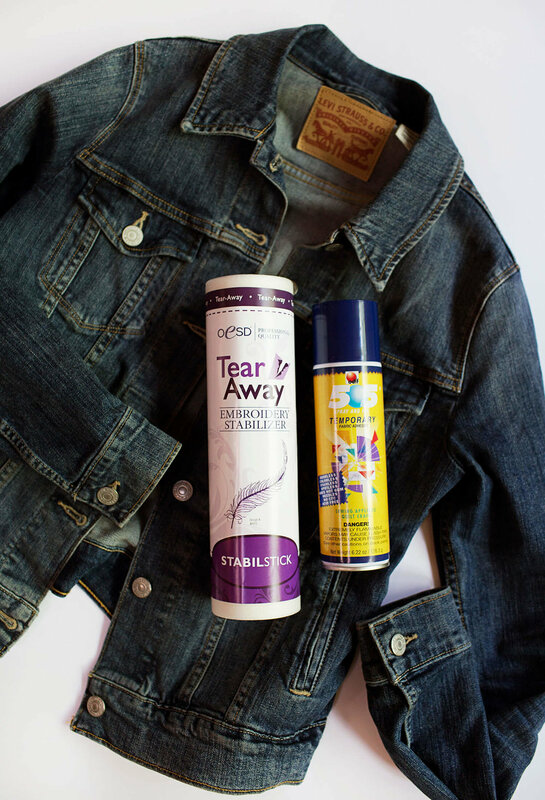 Spray the stabilizer with the fabric adhesive, and then stick the denim jacket (or other item) to the stabilizer. This is going to hold your clothing item in place while the machine (or you, in the case of hand stitching) embroider. You want to make sure your denim item is lined up within the hoop so that your design will be added in the right place. The Hero machine comes with a guide you can use, also the hoop has little indicators on it that help you line up the item so itâ€™s straight and centered as needed. Donâ€™t be afraid to peel the item off the stabilizer and try again until you get the placement exactly right. Taking the time at this step to ensure youâ€™ve got your denim exactly where it needs to be is important. And in case youâ€™re curious, the temporary fabric adhesive peels right off but IS strong enough to hold large denim items in place. It doesnâ€™t leave hardly any residue either (nothing you can see, just a little sticky until you wash the item). Amazing, right!? How do they make this stuff? 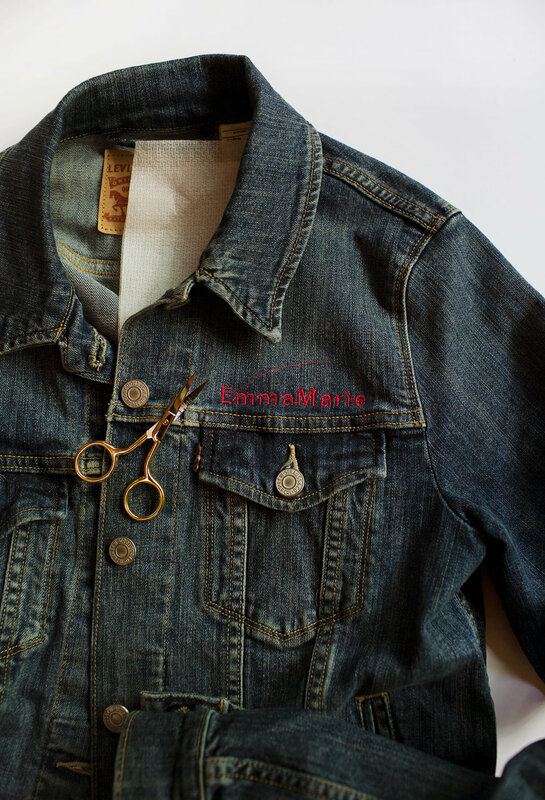 Make sure any excess fabric, so for the jacket in the photo aboveâ€”the sleeve and bottom half of the jacket, is placed around the machine so it can easily move the hoop slightly as it embroiders. You donâ€™t want the machine to get caught because you accidentally tucked the sleeve under the machine or something. Then use the screen to choose what design you want. There are designs the machine comes with (left option), text (middle option), or you can add your own design from USB (right option). If you add your own design from a USB, you will need to make sure it is formatted so the machine can read it. EverSewn has software that will do this for you on their website, but right now it is only for PC users. So you may need to get a friend to help you with this part! This was the jacket I added my first and middle name to, so I chose text and then spelled out the letters I wanted. You can resize the letters (or design) some within the machine. So if you are just starting to use this, I would recommend embroidering your text or design onto a scrap piece of denim first just so you can be sure you are happy with the size before adding it your garment. I call this part â€˜machine magicâ€™ because once you have everything set up and your design picked, you just let the machine stitch it for you. Itâ€™s amazing! It kind of reminded me of those pianos that play music and the keys even press down but no one is actually playing themâ€”you know? Itâ€™s crazy! Once the design is complete, just snip away any excess threads. And then tear (or wash) away the extra stabilizer. Easy! If you are hand stitching an element (like my little daisy designs above), you can follow many of the same steps. Just hoop your stabilizer and spray with fabric adhesive to stick your clothing item in place, then stitch away. If youâ€™re clothing item can be hooped itself, then you can do that, but denim and especially denim jackets donâ€™t work well this way because the fabric is too thick and they have elements like collars and sleeves that can make it difficult. Click to download the Babe with the Power file and worksheet here. You may need to make the design smaller in order to fit it through the hoops, here is a second embroidery file and here and here are the split design worksheets. Hereâ€™s what is on the back of my jacket in case you are curious. Claire gave me that big patch for my birthday so I used red embroidery thread for my name on the front to match the red patches on the back. Matchy matchy. Â© EverSewn. All rights reserved.